What is Water kefir ? Water kefir is a great probiotic beverage. 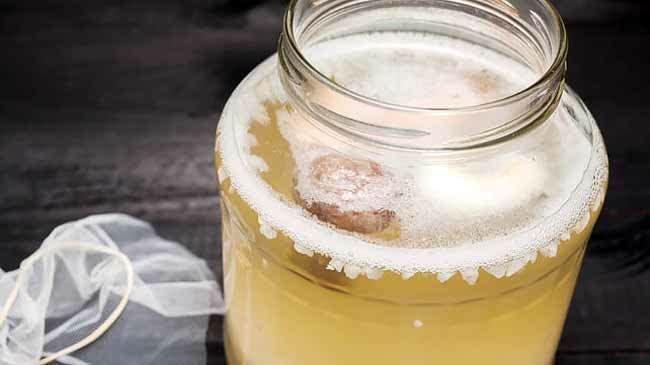 You make water kefir yourself using water kefir grains. After making the Water kefir it contains many vitamins and probiotic lactic acid bacteria. How to make Water kefir ? If you have Water kefir grains it is actually very easy. You make Water kefir according to a recipe (see article below). 1 jar of about 1 liter of capacity. Bottles of about 1 liter of capacity. What you need as ingredients ? If you just received your water kefir grains by postal, you should rinse them under running water. To make 1 liter of kefir you use about 100 grams kefir grains. Pour 1 liter water into the jar. Cut the lemon into 2 pieces. Add 30 grams of sugar. Best use organic sugar. Add 2 to 3 pieces of dried fruit. For example: dates, figs, apricots, raisins. Stir the kefir gently with a wooden spoon. Cover the jar with a breathable cloth and put in a bright place, not in direct sunlight. After about 1 to 3 days you can harvest. The longer you leave it, the more it will ferment. Surely harvest after 72 hours, otherwise the kefir grains run out of food. Open the jar, remove the cloth. Remove the dried fruit and throw it away. Squeeze the lemon halves from above the colander. So, the lemon juice gets into the bottle. Strain the kefir. Pour the kefir above the sieve into the bottle, it is ready to use and can be kept in the refrigerator. Rinse the kefir grains carefully under running water. Start Again with the set-up and start your next kefir batch. What type of sugar to use ? This may be organic sugar, cane sugar, agave syrup, juice concentrate, coconut blossom sugar. Where do I get kefirgrains ? Kefir is growing constantly, if you take care of them properly and use the right products, your kefir grains will grow slightly each time, after each batch. At one point you can start making 2 jars with kefir, or you can make someone else happy with the kefir grains, so that person can also start with making kefir. Or else you even can eat the kefir grains, give them to your pets. Do you know anyone who has water kefir grains ? You can also order them online. Take a peek at the KEFIRSHOP.eu. Use no honey. Honey has an antibacterial effect and therefore it will kill the bacteria in the kefirgrains. Best only use plastic material. Wash the jars and bottles just with hot water. Detergent can also affect the kefir grains. Use organic ingredients. Pesticides can also affect the kefir grains. Look out, when you close the lid of the jar, while fermenting there is a rish the jar will explode, we only use a breathable cloth. Alcohol in water kefir ? Note that by fermentation alcohol starts building, water kefir contains a small percentage of alcohol. The alcohol content is estimated at 0,2 to max. 2%. On this website you can read all about Water kefir. Rinse the kefir grains under running cold water. Dissolve the sugar in some hot water. Stir well. Pour the rest of the gallon of water into the jar. Allow the water to cool down to room temperature. Place the kefir grains and the dried fruit to the water. Cover the jar with a breathable cloth or coffee filter (to keep away the fruit flies), put the jar somewhere warm (not in direct sunlight). After about 24 ~ 48 hours the kefir will be ready. To separate the grains, fruit use a strainer, pick out any fruit or lemon. Squeeze the lemon into your strained kefir. Throw away the dried fruit. You can keep the strained drink in the refrigerator. Rinse the kefir grains under running water. 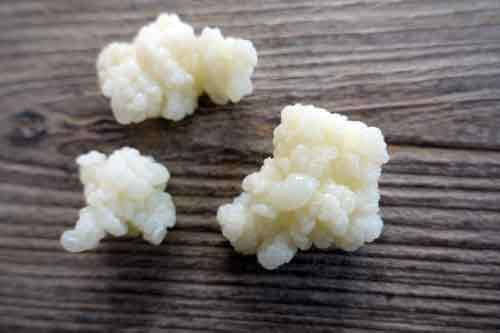 The kefir grains can be used immediately for the next preparation. Do a second ferment. You may drink water kefir after the first fermentation but it is flat. A second ferment brings the carbonation and tastiness. Always “burp” your bottles during the second fermentation. The carbonation build-up over time can lead to the jar exploding. Measure out the amount of kefir grains (ratio : 1/10) you want to use in your next preparation. Use spring water. Spring water has many minerals, minerals are important for the health of your kefir grains. 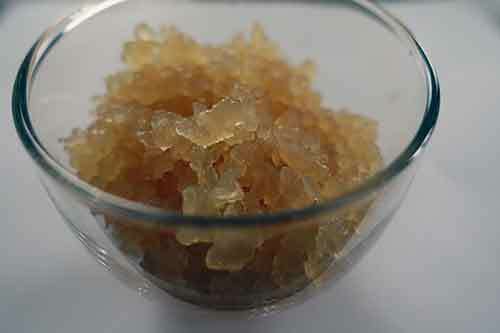 Where can I find water kefir grains ? 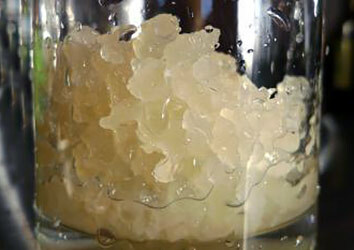 You can purchase water kefir grains at the Kefirshop.eu. The Kefirshop delivers water kefir grains across Europe. They have live water kefir grains, but also the dried water kefir grains for sale. Live water kefir grains are grown in unrefined organic sugar, molasses and spring water, detailed instructions and support are provided by the Kefirshop.eu. The kefir grains will multiply quickly so you should never need to buy kefir grains again. Shipped First Class – Orders are posted on Monday till Thursday, to avoid being in the post office over the weekend. Kefir can be shipped to following countries : Europe: Albania, Andorra, Bosnia and Herzegovina, Bulgaria, Cyprus, Denmark, Germany, Estonia, Finland, France, Georgia, Gibraltar, Greece, Greenland, Hungary, Ireland, Iceland, Italy, Croatia, Latvia, Liechtenstein, Lithuania, Luxembourg, Macedonia, Moldova, Montenegro, Nederland, Norway, Poland, Portugal, Romania, Russia, San Marino, Serbia, Slovakia, Slovenia, Spain, Czech Republic, Turkey, Belarus, Sweden and Switzerland. Water kefir spelled as “keh-feer” is a fermented drink that contains good bacteria. Water kefir is remarkably easy to prepare, the flavor is slightly fizzy lemonade and pleasant to drink that even kids can consume it. This flavored beverage provides good nourishment to the body. What is Water Kefir is all about? Like Kombucha, water kefir is a traditional beverage that has “SCOBY” – Symbiotic culture of bacteria and yeasts (good bacteria). The bacteria and yeasts present in the beverage metabolize the sugar, turning into various different types of beneficial acids, additionally it also contains high dose of Vitamin B and food enzymes. What is the difference between Water Kefir and Kombucha? Though, Water kefir and Kombucha contains healthful microbes for your body, Water kefir has the richer source of Lactic Acid Bacteria, which makes it a super healthy pro-biotic supplement to drink and Kombucha is more like a digestive aid. Another major difference is their brewing time. Kombucha takes about 7to 30 days to finish fermenting the liquid or you can put an average 2 weeks. Whereas; Water Kefir on the other hand takes about only 2 days to ferment the sugary liquid. The kombucha during the process will create a baby SCOBY with every batch, and eventually it will be big enough that you can separate the baby SCOBY from the mother so that you will 2 SCOBYs ready for brewing. Water kefir also keep reproducing and multiplying, forming individual grains. You will notice that each time you strain out the water kefir from the liquid, you will have marginally more. There are 2 type of Kefir grains available Milk and Water. 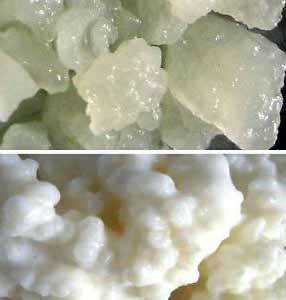 The kefir grains are different and their make process also varies. 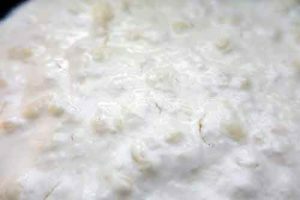 White kefir grains are cottage cheese white looking whereas water grains are cauliflower and translucent which easily breaks under the pressure. The milk kefir grains feed on the lactose present in the milk whereas water kefir grains feed on sugar. Water kefir roots points towards Tibet or Mexico, at times Russia is also said to be the origin of this healthy beverage. This probiotic drink has been around for centuries with different names like “California bees”, Tibicos, Japanese water crystals etc. In Mexico it is widely recognized as Tepache. Off lately, water kefir has gain popularity because it provide nutrition to the body and most importantly it is the best homemade probiotic drink that you can prepare at home without stretching your wallet. We deliver Kefir grains in Europe - Buy Milkkefir & Waterkefir here.